Back in December I met this 10 year old girl named Camille. She was a really cool kid. She's the kind of kid whose parents probably don't understand her. She's probably looked at as being odd and kind of weird. And she's probably looked upon that way by her classmates. Regardless, she was crawling on her knees barking...and I swear she really sounded like a dog. Then she did an old man's voice and started to sweep the floor, saying "friggin kids, with their friggin partys...always partying it up. Friggin kids." It was pretty hilarious and I was the only one laughing. When everyone was telling her to be quiet and to stop it, I encouraged her to keep going. She's a cool kid and I hope she never loses her ability to be silly. God knows we need more of that in this world. 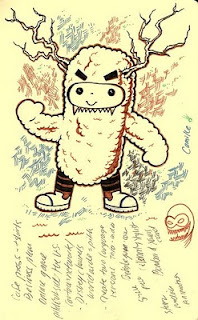 Camille here, is a little girl who desperately wants to be a monster when she grows up. I know this kid, although in our case her name is Lana. Her parents are very proper and awfully nice but this young lady insists on wearing big old grungy shirts from the thrift store, collects bugs and plays with swords. Great Caricature both in words and in the sketch. I remember when my girls were little they would dress up in those pajamas with feet, so cute. Then one day ones their PJ's looked a little full - seems they had shoved all of the beanie babies in while she had kittens or puppies or something! Sigh - kids! gotta love 'em. I want to be Camille when I grow up. Somehow, I am really glad my two are past that stage and are now merely weird teenagers. I feel more comfortable. @Laine Thank you. That's a great story and has inspired an idea. @Diane it's not too late. @Rosanne haha...I'd rather be 5 then be 15 again. It was just easier. It's a good thing we can't step in the same river twice, isn't it? I remember myself as a 15 year old. It was pretty grim.